It is appropriate that I start this series with Ronald [Rennie] Weinstein. The friendly, bushy mustachioed gentleman, who along with his trusty sidekick, Moxie, can be found outside Vox Pop on most weekday mornings. I knew Rennie would be a good first interview to help kick off this series, because of his natural and relaxed ability to tell stories. Basically a Brooklyn boy, he spent most of his childhood shuttling between Brooklyn and Texas. His Jewish father was a career man in the Army and when home, spent their time in Brooklyn taking Rennie to synagogue, while his Texan mother, a half Choctaw Indian exposed him to bapist church and Sunday school. His childhood was a combination of high holy days, Hebrew school and baptism. His parents stayed happily married for the extent of their married lives. “But life has been very good,” he said reflectively. “I managed to get all the diseases of my parents: heart disease, alcoholism, diabetes etc. So I had to make big changes in my life.” But he seems to be enthralled with the mysteries of life and what keeps things interesting. To my eyes, I was looking at a relaxed and healthy man. 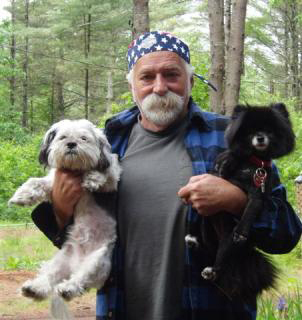 An avid motorcyclist, he described a recent trip to Lake George with 250,000 other bikers. He put Moxie on the back with his camping equipment, to spend 6 days camped in one of the many towns around the lake. At 64, Rennie is a great example of someone who is living his life to its fullest. 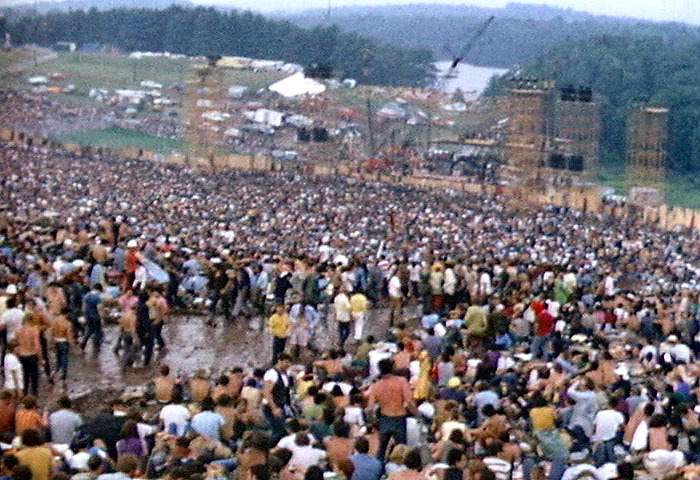 A self proclaimed “Woodstocker,” his first date with his [first] wife was at Woodstock. He still has the tickets. “We had my 67 Volkswagon with flowers all over it and the whole hippy deal. We got as far as we could on the highway until we had to pull the car off the road and continued on by foot. We got right up by the stage. In the evenings we walked to a restaurant and ate Italian food. We found a big house that was not occupied. It had a big porch and we were able to put our sleeping bags underneath and stay dry at night. Then we would go back and be in the middle of everything.” He took on a job there working for the hog farm and talking people down from acid trips. There was a shortage of volunteers, but he knew what he was doing, so he was able to perform a service while attending this historic event. He also attended the 1970 concert at Powder Ridge. An easy going and friendly presence at Vox Pop, Rennie is very approachable and willing to share stories and jokes with those hang out there in the early part of the day.